Egg whites and sugar are stiff and shiny. As for adaptations, I substituted a chocolate wafer cookie crust for the vanilla wafer cookie crust, both for taste and appearance. 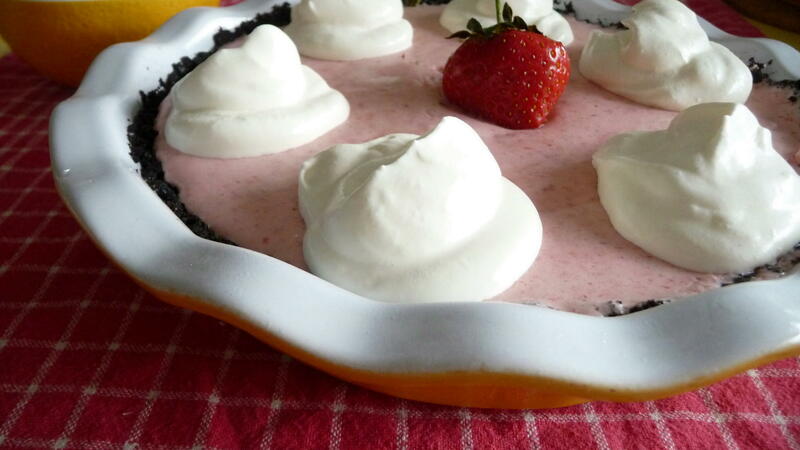 The vanilla cookie counterpart would be tasty, too, but I prefer the rich chocolate cookie crunch as a counterpoint to the light, fluffy, and delicate strawberry interior – also black and pink were big together in the 1950s, so it is graphically appropriate, too, as a retro dessert. Otherwise, I added fresh mint and black pepper, sort of as an homage to Christine Ferber’s strawberry jam which incorporates these two unexpected ingredients into the most delectable preserves around. The mint and pepper highlight the strawberries but do not stand out themselves – sort of like adding espresso powder in chocolate baked goods. Ms. Casey calls it “pink and puffy”, but I think of it as “pink and puffy and perfect” strawberry chiffon pie. I bet you will agree. To make the crust, preheat an oven to 375 degrees F.
Thoroughly mix the cookie crumbs, butter, and sugar in a medium bowl. 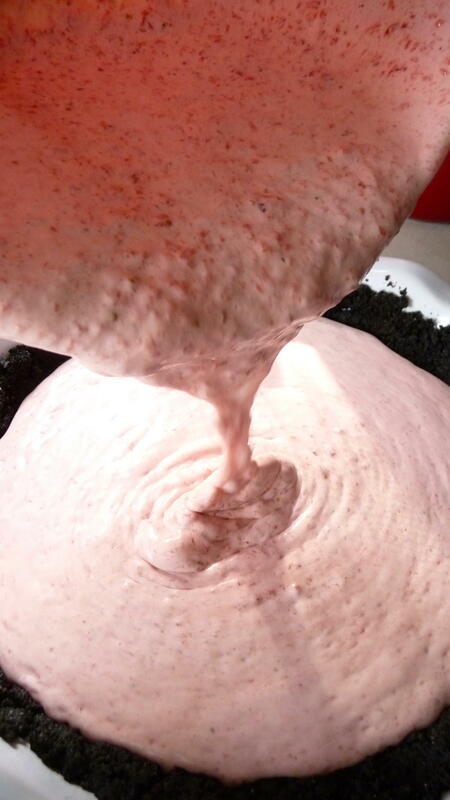 Put the mixture in a 9-inch pie pan and press evenly into the pan bottom, then up the sides and out onto the rim. Bake for about 6 to 8 minutes, then let cool to room temperature. Let the mixture sit for 10 minutes (no longer!) before continuing. Meanwhile, in a small saucepan, stir the cranberry juice and gelatin together. Stir the mixture over low heat until the gelatin is just dissolved, then pour into a large bowl and set aside to let cool. Add the strawberry mixture to the cooled gelatin mixture. 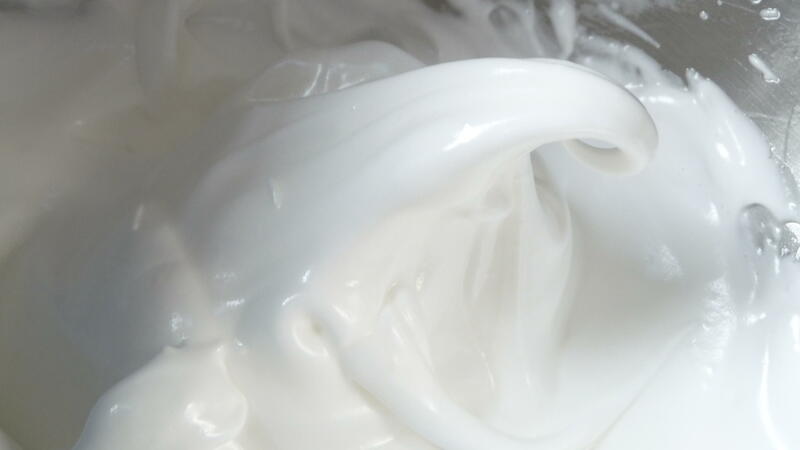 When the mixture is partially set, quickly whip the cream in a mixer until quite stiff and then refrigerate the cream while you whip the egg whites. In a clean, grease-free mixer bowl, beat the egg whites on high speed until soft peaks form. Then very, very slowly add the remaining 1/4 cup sugar, 1 tablespoon at a time, and beat until stiff, glossy peaks form. 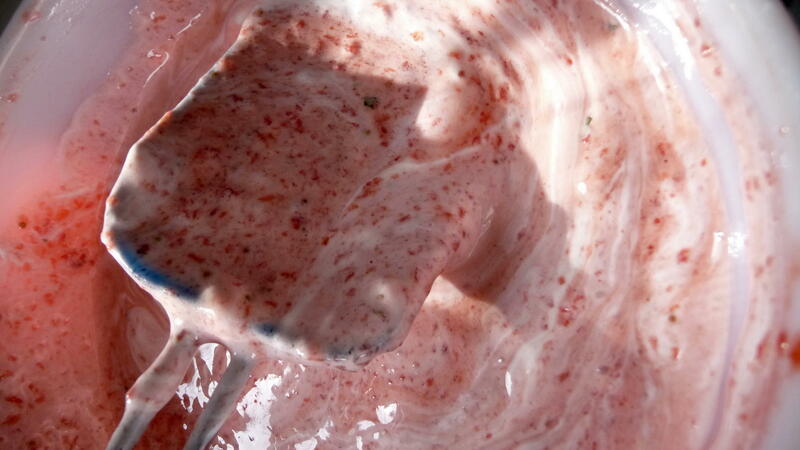 Gently fold the egg whites into the strawberry mixture, then gradually and very gently fold in the cream. Working quickly, mound the filling in the cooled pie shell. Refrigerate the pie until the filling is firm, at least 3 hours. 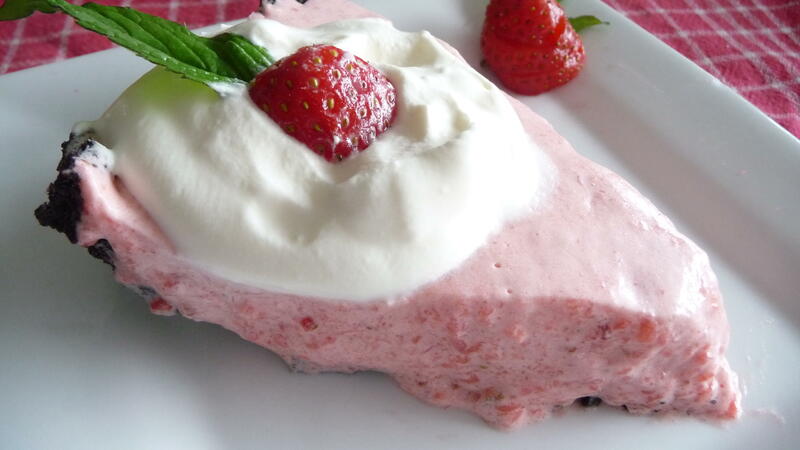 Garnish with sweetened whipped cream and halved strawberries. Keep any leftover pie refrigerated for up to 2 days. This entry was posted in Baking, Dessert, Pie, Recipes Misc and tagged chiffon, Island life, Pie, strawberries. Bookmark the permalink. The chocolate crust is really smart. How can you go wrong with chocolate and strawberries? Thanks, you two. I agree, though I think vanilla will go with strawberries, too…just not as well, in my book! Chiffon cakes are all over Southeast Asia. It never disappeared. Think pandan chiffon cake in Malaysia and Singapore, purple yam cake (chiffon as base) over here. I suppose it’s quite appropriate for the hot and humid weather in this region since chiffon cakes are much lighter than other types of cakes. Looks appetizing. Too bad strawberry season has ended over here. 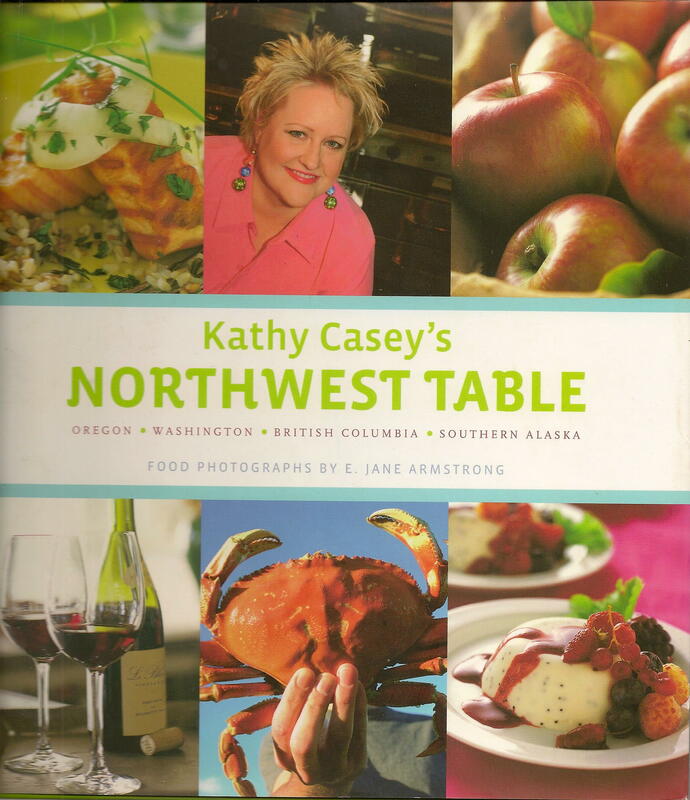 I don’t know why, but whenever I hear Pacific Northwest or Alaskan cuisine, the words ‘salmon’ and ‘smoked salmon’ come to mind. Yes, salmon is a mainstay of our cuisine – smoked, cured, and prepared in every other way. Woaaaah, Dan! This is so retro awesome! I love it 😀 It’s so pink and fluffy… too cool. Perfect summer time dessert? Thanks, Jax. 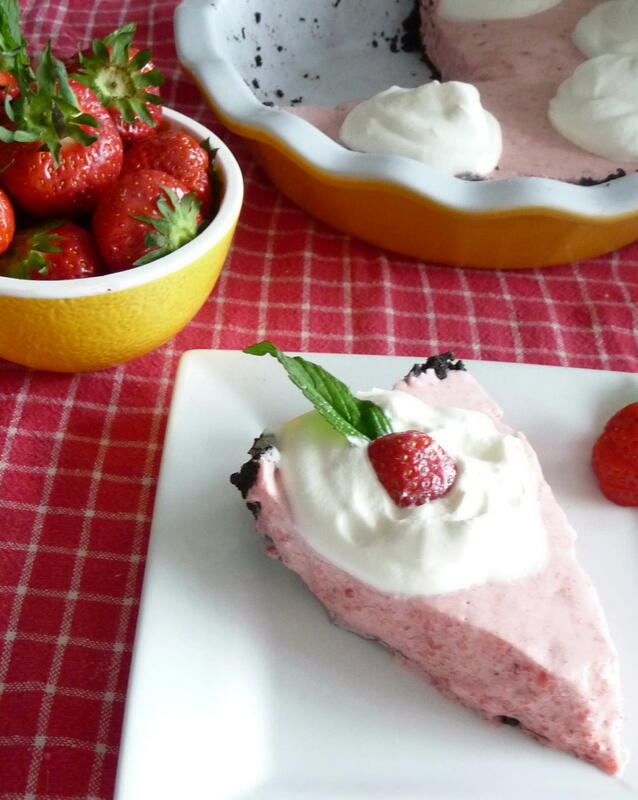 This strawberry chiffon pie is almost as sweet as you are – for making such a laudatory remark! I think the pie would be perfect for celebrating (or for emotional-eating, to compensate for a less-than-desired outcome) during a picnic on Murray/Henman Hill next Wimbledon. You’d be unique at The Championships for your take on strawberries-n’-cream, no? Thanks so much, Abraham. You are very kind to stop by and say such things! Do tell me how the pie turns out. I love to hear about the results. I remember those chiffon pies from the 50’s to the 70’s…I loved them and actually they are still around, now only called something fancy like strawberry mousse tart or the likes. Yours remind me of those golden childhood days…lovely! A great post to read this is too! Hi. My first time here as your blog was recommended by a good friend for a raspberry chiffon pie (been busy picking the last several mornings), so I’ll be making adjustments as I go along. However, do have a question. In the filling portion, you state 1/2 cranberry juice, but 1/2 of what? A cup, or a bottle? And if a bottle, what size? Also, in step 5, you state 112 of sugar. I figured out you meant 1/2 c sugar (since you go on to use 1/4 c later on) so you might want to correct that. Sorry, I’m a proofreader in my other life so I’m constantly seeing mistakes. I even proof menus when I go to restaurants. Thank you for what looks like a great recipe, and I will be back! Hi, Sandi. Thank you thank you thank you for catching those errors! I hadn’t caught them, after having scanned the recipe, which I then adapted somewhat. I really appreciate your careful reading of the amounts and have now updated the recipe to read “1/2 cup of cranberry or cranberry-raspberry” (more my own mistake in rushing here) and “1/2 cup of sugar”. Please do let me know how it turns out for you. I will be grateful for any future errors you find, too! I forgot this cake even existed! What a delightful reminder. I can’t wait to make it! Hi, Jess. Thanks for your comment. I hope all is swell with you and the fiance in TO. I will absolutely make this over the weekend. The chocolate cookie crust and the pepper sound like excellent tweaks. It’s beautiful too so it would be great for company! Thanks, Geni. I appreciate your stopping by. I’d love to hear how it works for you!! Did you save a slice for me…? I’m a strawberry fiend, and the season was really short in D.C. this year! So jealous. I love your aside about Canada’s Southwest. I must admit, I’ve been dreaming about a trip to what I think of as the Pacific Northwest (including Vancouver), but now I’ll be sure to remember this distinction! Maddie, our strawberries are just about gone (as was the pie in the 48 hour window it has). Ahh, Goldilocks. Before I came here I knew Goldilocks as a girl who had porridge, bed and chair issues until she found them all ‘just right.’ That’s all changed now! I now associate it with diabetes-inducing cakes and pastries with mile-high frostings. Needless to say, I don’t recommend it, save your time and money.